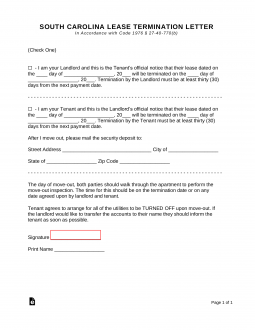 The South Carolina Lease Termination Letter is a very simple yet legal document that is required for nearly any rental agreement in the event either the landlord or tenant would like to serve 30 days notice to vacate the premises. This document will serve perfectly the need to provide legal notice one to the other. Once it’s been served, notice has been served.